Dear WKF Referees and Judges! WKF RC administration is updating database for the WKF Referees and Judges. This process is important for better communication with all of you, but then we need your cooperation. Please attach your actual passport photo (.jpg format). This photo will be used for accreditation to the official championships. We do not have e-mail address to some of WKF referees and judges, especially to the new one who received the Judge-B license in Dubai. Please send this mail to other international referees and judges of your National Federation. Thank you very much in advance for your help and cooperation! 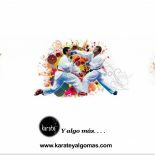 Esta entrada fue publicada en 30 mayo, 2017 por Hito Kata San men en WKF y etiquetada con WKF.